Quilting, a long-honored traditional pastime, is often recognized for its preciseness of pattern, mathematical detail and specific structure. However, one historical form of quilting from the 1800's that completely abandons these principles has been making a robust resurgence in the quilting world: the Victorian Crazy Quilt. Crazy quilts emerged as a money-saving technique during colonial times. Women determined to stretch their funds as far as possible collected scraps from old blankets, worn out clothing and bits of other cloth. These scraps were sewn together with no particular pattern or planned design to make extra utility quilts for keeping the family warm through winter. The quilts became popular not only for their economic value, but also for the opportunity they offered to express individual creativity. 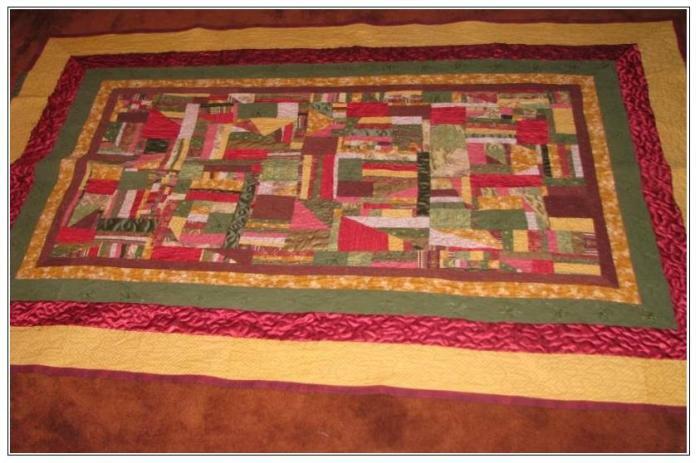 Crazy quilts continue to offer this creative outlet for beginning and advanced quilters alike. This particular tutorial is designed for beginning crazy quilters and will offer step-by-step directions to creating a straight-edge crazy quilt. Maybe you just finished a sewing project and have significant waste left from your material cutting, or perhaps you have a "scrap bag" that has been collecting bits of material for years. If you don't have any scraps on hand you can visit your local fabric store and pick fabrics at random, getting small cuts of each, or choose a variety of fabrics within a similar color vein. Gather your scraps and get ready to sew. 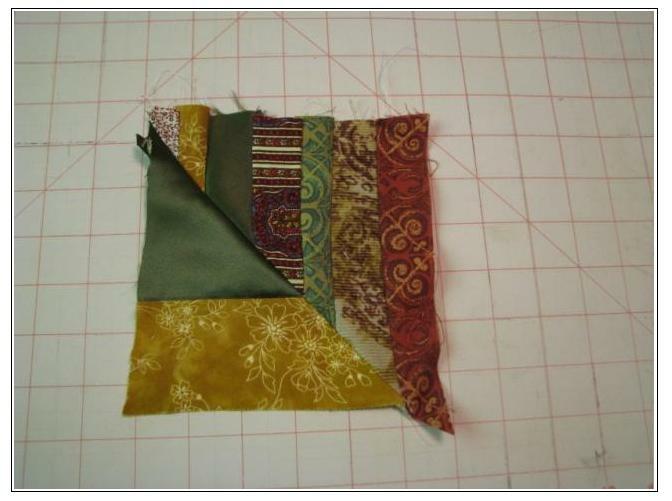 To complete this beginner's crazy quilt you will be sewing and cutting straight edged pieces. You will want to cut your scraps into squares, triangles and rectangles in a variety of sizes. Straight edges are easier to work with and connect. 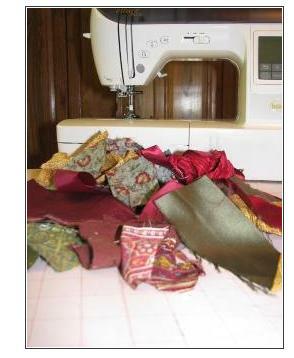 Once you have mastered a straight-edged crazy quilt you might try your hand at an appliqué crazy quilt. Step Three: Fit Your Pieces Together! After cutting your fabric you will begin to piece together sections that seem to match one another. Try to mix and match your materials. The most visually pleasing part of a straight-edge crazy quilt is its variety of colors, angles and patterns. If you have any quilting experience you know that the method to assembling a large quilt is to build the quilt block by block. While it is true that crazy quilts have no particular pattern to assemble, it is still easiest to manage assembly by thinking about your quilt in terms of blocks. Blocks for a crazy quilt should be squared sections, roughly the same size that can be laid side by side and sewn together as a quilt grows. You should create as many blocks as needed for the desired size of your project. Conventional quilt sizes are listed below. Remember to account for seam size when figuring out the size of blocks you want to create. Baby Quilt 36" x 54"
Personal/Lap Quilt 54" x 72"
Twin Quilt 54" x 90"
Double Quilt 72" x 90"
Queen Quilt 90" x 102"
King Quilt 108" x 108"
After assembling all of your blocks arrange them in an order that is pleasing to you, pin adjacent blocks to one another in preparation for sewing. Using your sewing machine with a straight stitch sew each row of blocks together, one to another. Because your crazy quilt may be made from a variety of fabrics of different textures and different weights it is very important that you re-enforce your seams by reversing your straight stitch at least once at the beginning of a row of stitches and at the end. 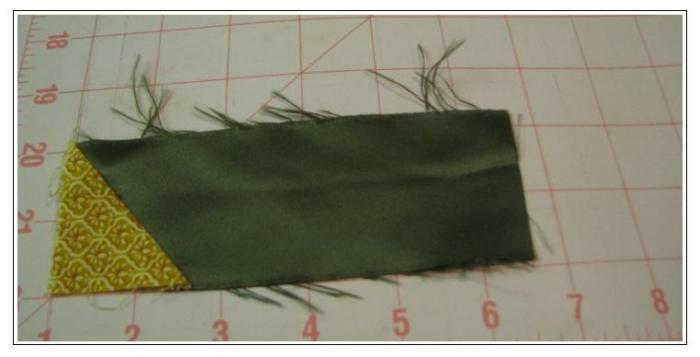 You should also iron each seam as you sew to minimize bumps or wrinkles that might form as your quilt is assembled. After you have completely assembled several rows or sections of blocks, sew the rows/sections together progressively until the entire quilt top is complete. Baby Quilt 45" x 60"
Personal/Lap Quilt 60" x 72"
Twin Quilt 72" x 90"
Double Quilt 81" x 96"
Queen Quilt 90" x 108"
King Quilt 120" x 120"
When it comes to finishing a straight edge crazy quilt there are several options: traditional crazy quilt embroidery, hand quilting or machine quilting. You should choose a method that is appropriate to your quilting experience and ambition. If chosen well, the quilt finishing will set off your quilt-top design, making your crazy quilt even more striking. Additionally, you might consider adding border pieces to your crazy quilt to really emphasize your designs dramatic presence. 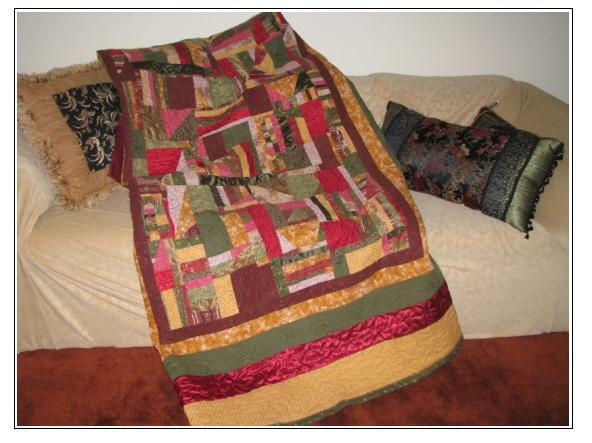 Step Eight: Snuggle Up And Enjoy Your Beautiful and Traditional Quilt!